We partner with 100+ vendors to place consultants with our clients nationwide. Kforce has a team of Vendor recruiters who are available to assist you in finding your candidates a job by utilizing over a 1,000 person sales team. Each associate is fully trained on current immigration practices and can help assist with complex visa situations such as Denials, Visa Stamping and RFEs/Client Letters. 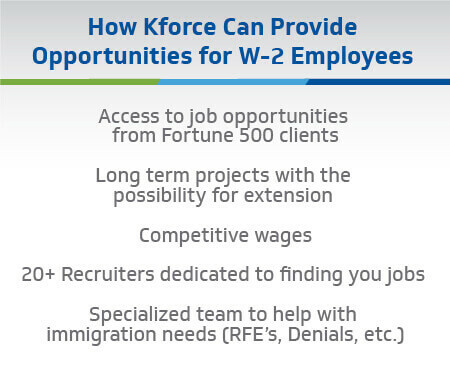 Kforce partners with Fortune 500 clients, which gives you access to hundreds of new jobs a week. Our Vendor team has been placing corp-to-corp candidates since 2000 across our 60+ offices nationwide. We are currently seeking quality partners to join our team. We expect our vendors to provide candidates that are on their W2 with 100% verifiable resumes and work authorizations at time of submittal. Our partners keep us informed on changes in visa status, availability and maintain a high-level of candidate control. Interested in Becoming One of Our Vendor Partners?